Staff from Bega Valley Shire Council's Waste Services Team and the Bournda Environmental Education Centre were behind the 'Working with Waste' day, which turned out to be a great success and eye opener for the kids. Council's Waste Services Officer, Sam Ferrara said that waste reduction is often the last thing on kid’s minds when they sit down for lunch, so encouraging students to think about what happens when their wrappers and food scraps have gone to the bin was a great start. "We found that kids are really open to thinking about waste and the journey it takes after leaving their lunchboxes and it's really encouraging that everyone took the message seriously about reducing waste," she said. Bournda Environmental Education Centre Teacher, Jules Donne said the students learned about waste through a 'Waste Relay' game and an interactive iBook activity. 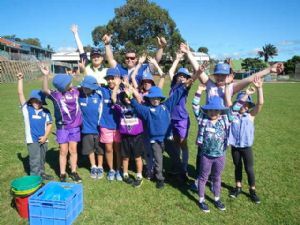 "The next step was for students to conduct a waste audit of the playground rubbish at the school. With gloves and tongs at the ready the students sorted through two bins worth of lunchtime rubbish and weighed and recorded the results,” she said. "The results showed that if students placed all recyclable materials into recycling bins and if all food scraps were composted then the school could reduce its waste to landfill by more than 50 per cent. "Students from the School's Enviro Club have already come up with loads of ideas about how to work on this reduction of waste to landfill and their job now is to come up with an action plan. "We were amazed at the great ideas the students came up with to help improve waste management at the school. “The students believe that they can change the way they deal with rubbish at the school, which is fantastic. I really look forward to seeing what happens next,” Ms Donne said. The Working with Waste day was part of a regional waste education program which is run by the South East Resource Recovery Group (SERRG) in partnership with the Bournda Environmental Education Centre (BEEC). Mini grants of $500 are offered to schools to support improvements in waste management and to work collaboratively with local councils and the BEEC. Photograph: Council’s Sam Ferrara with the Eden Public School Enviro Club. L-R - front: Chaise Rootsey, Jack Young, Conan Kingsley, Chris Feeney, Tama Robin, Natalie McKenzie, Uri Francis, Ruby Ewin, Bridie Sarrell, Jaylee Mitchell, Brooke Chester. L-R – back: Sam Ferrara, Cody Crane.